Why We Fear gets to grips with the essence of fear in life and in business. Why We Fear uncovers the mechanisms of fear and the huge role this often misunderstood emotion plays in our daily lives. At the same time, it dismantles fear into understandable and actionable parts. When fear is divided into its constituent parts, the hidden workings of fear and fear based habits become visible. In this way, the book charts a road-map for how to deal with this often destructive emotion, and the heavy cost of fear in life and in business. Fear has always been at the very core of human experience, and yet people generally seem to believe that it is a force of nature outside their own control. Fear is often seen as a mystical, poorly understood influence that creeps up on us at the worst possible moment, wrecks our performance, dulls our wits, and makes our lives shrink. Why We Fear robs fear of this mystique. 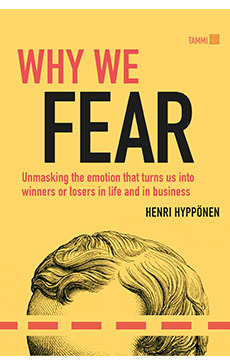 In addition, as Henkka Hyppönen points out, fear is not always a disastrous and destructive force. Sometimes, a little injection of fear helps us to perform better as individuals and as teams.